When you, as a person in a discussion, realize PoPo™ has hit the point where you have met the Wittgenstein Wall™ then you have the best, the simplest, the most useful remedy at your disposal. This is what will bring the conversation back under control. It will either clarify the terms, words, concepts, etc to the point where they can be spoken about in useful ways that have meanings or they will show the conversation to be worthless and not worth engaging in. The first question should be obvious, but because of our conditioning is not. An experienced Map Thinker™ will automatically notice the presuppositions in the statement. With a little practice this takes no thought. It just happens. You too can be a leader. It assumes you are not a leader. It assumes you want to be a leader. It assumes being a leader is somehow a good thing. It assumes the person or company can teach you. Once you see the presuppositions you can question any of them or all of them. Should you spend any time thinking about something simply because you hear it or read it? Closely related to this is the traditional “Cui Bono”. You have so much time on earth. The time you spend thinking about becoming, or not becoming, a leader could be spent doing something else. Something that will reward your time either in amusement, learning, or something else. You may enjoy thinking about this particular dumb slogan, (I found it enjoyable). Then do so. It may be that examining that slogan might produce insights into your own character or that of others. I did. There is really only one reason for doing anything. You receive a reward for the resources you put into it. The reward can be immediate. My immediate reward for writing this blog is that I enjoy putting my ideas on paper and I believe someone somewhere will find reading these blogs rewarding. The reward can be so distant, such as membership in Heaven, or The Elysian Fields, etc that you have to die to find out if you even receive it. Most of us settle for in between rewards. I go to work five days a week so I can do what I enjoy during the evenings, weekends, and holidays. Students are asked to go to school whether they like it or not, whether they are suited to it or not, whether they care about what they are learning or not, whether what they are learning will benefit them in the future or not — with the vague hope they will get a better job than the person sitting next to them. If they would prefer to be happy, healthy, or wise, or even wealthy, — No offer is given them. Only that if they succeed in school they will, on average, receive more money during their lifetime than those who do not. Is it any wonder most boys would rather play football where they can receive immediate rewards and instant respect? Why bother with the question? It should be asked more often. So what questions should we take our time and resources to ask? If, like me, you enjoy exploring certain questions then that is the answer. If you are not going to enjoy exploring the question for the sake of doing so, then we have to determine what reward we expect to get from doing so. This is very much like going to work during the week so you can go fishing, or watching football on a big screen TV on weekends. If you were to study logic then you would be encouraged to be logical and rational at all times. Whether the issue was important or not. Mapology™ would encourage you to be rational only when the reward for doing so is worth the time and effort you are going to spend decoding the situation. Usually this entails an expenditure of resources versus rewards for doing so. Making choices that need to be made, reaching agreements that need to be mutually adhered too, that allocate resources towards a goal are the only reasons to apply the time and effort to solve a problem that you do not enjoy solving for the mental challenge. Using this scale which movie you want to see may be more reasonable to devote thinking too than whether war should be waged over a specific issue. Your choice in movies involves two hours of your time to be spent, and the two hours of time you already spent on your job earning the money to pay to get into the movies. A total investment of four hours of your life. You want to see a movie you are really going to enjoy. Your choice in whether your country should go to war will not be counted. Your share of the amount of its cost will be taken from your paycheck without your consent. Its impact upon you cannot possibly be determined ahead of time. On the other hand voicing your opinion does have value. Every time you voice your opinion exposes someone else to it. That exposure may encourage the other person to modify their opinion, change their opinion, or agree with you. The next person they speak too may be effected by the effect you had on the first person. Slowly the world may come a little closer to agreeing with you. When that happens change will happen. On the other hand asking questions can be fun. I asked the girl wearing the shirt questions. She believes everyone wants to be a leader and anyone who claims otherwise is crying sour grapes because they don’t want to admit they are failures. However she knew that if they faced up to their true desires they too could learn to become leaders no matter how old they were or how often they had failed in the past. Her college courses had brainwashed the poor girl as thoroughly as any off beat religious cult would brainwash its coverts. This is one reason to get into the habit of asking questions and never accepting anyone else’s answers. The more easily a person accepts the conclusions of another the more easily they are under the influence of anyone they perceive of as having authority. The less easily a person accepts the conclusions of another the more apt they are to think for themselves. Map Thinking ™ is the tool of choice for those who wish to think for themselves. QaQa™ is the tool of choice for those who wish to maximize their ability to think for themselves. Tags: Cartography, Cui bono, Film, Person, Question, Reward system, Thought, Why Bother? If you have born with me through the last blogs you now have three simple, easy to learn, easy to use, actually fun, tools that will enable you to cut through garbage thinking. PoPo™ stands for the Principle of Progressive obscurity. The idea here is simple and easy enough for any child to comprehend. The more specific, the more concrete, the subject you are talking about the more you know exactly what you are talking about. 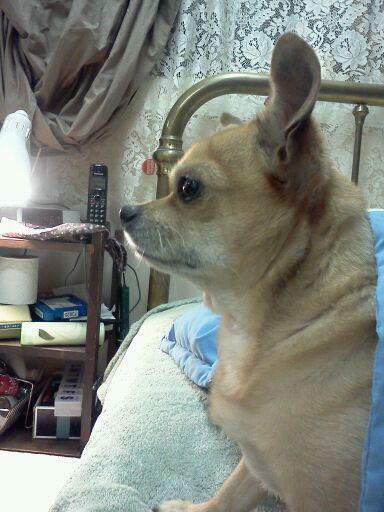 If you are talking about a specific dog, say the Chihuahua in the picture, the more you can know about that dog. We can say he is an older dog. That he is a Chihuahua, you can count his teeth, discuss his penchant for eating fresh tomatoes out of his mistress’s garden, etc. You can learn a lot about this specific Chihuahua. The problem is all this information will tell you little about Chihuahuas in general. You can guess that not all Chihuahuas will like to pluck tomatoes out of the garden and munch them but you can’t know how common that impulse is among the breed. You can learn a lot about Chihuahuas in general, but all of this information will only tell you what to expect if you deal with a sizable section of Chihuahuas. It will not tell you a lot about what to expect in any particular Chihuahua. The particular Chihuahua might very well be atypical. This is a sort of Heisenberg Principle of Language. The more you know about the concrete object you can see, smell, taste, touch, and hear, the less you know about the larger, more general case. The larger the general case the less you know about the concrete, specific instance of that case. Thus you can know a lot of things about dogs in general. But that knowledge will only give you general clues to the nature of any specific breed of dogs. The group of dogs called Chihuahuas may be very atypical in some respects to other breeds and any one Chihuahua may be atypical of its breed. Keeping PoPo™ in mind helps you to realize how little or how much you know at any given time about the subject you are talking about. It also gives you insight into how much the speaker you are listening too actually knows what they are talking about. Politics and advertising are rife with slogans that have no meaning. I call it the Wittgenstein Wall™. Clarity to a certain degree depends on who is speaking and who is being spoken too. A pair of electronics engineers will talk together in terms that would confuse the average electronics technician let alone a lay person. The key is they would both know exactly what the other is saying and be able to explain to the lay person what was being said. Business people, on the other hand, often speak to each other in jargon so obtuse they find it impossible to explain to a lay person with any precision what it is they are talking about. Lets take a look at ads. One of my favorite is, “Genuine old fashioned (insert [I’m thinking peanut butter]product) now new and improved”. It is also humorous. (I find it funny). But it sold (¿peanut butter?). If you approach the sentence, “Genuine old fashioned product now new and improved.” From a logical standpoint “Genuine old fashioned” and “new and improved” openly contradict each other. Which is true. When you look at the sentence from a word for word standpoint you realize none of the words have real meaning. Real. True. Correct. Honest. Authentic. As a modifier. It has no “genuine” meaning until it is given something to mean. Genuine peanut butter. Genuine butter. Genuine wool. Genuine milk. Genuine anything is anything with genuine in front of it. It does imply that other peanut butters, other soaps, other milks, are not genuine. It implies they are fake. Several things are going on here and logic cannot encompass them. But Logic, or at least the penchant for the either / or aspect of pseudo logical does help to explain what is going on. I say pseudo logical because Logic, as used by someone who knows and understands the intricacies of logic, such as a professor of philosophy, will automatically compensate for Aristotle’s “excluded middle”. In other words the less a person knows about genuine Logic the more apt they are to believe that stating everything in “either – or” statements are Logical. So people, consciously, or subconsciously, who have not broken the socially trained instinct for “either-or” thinking will respond to “genuine peanut butter” as though it were the genuine article and other peanut butters were not. In truth the law defines what can or cannot be called peanut butter. The law and I disagree about what “real” peanut butter is. The law says peanut butter does not have to have any peanut oil in it. All the peanut oil can be taken out and substituted with cheaper, less healthy, oils — And by law it can still be called peanut butter. When dealing with the law one has to be very aware of PoPo™. Legal definitions come about because there has been a legal disagreement in the past that was decided in a court of law. The legal definition that was decided upon may not be the one you would think or expect. Most people assume that once they divorce their spouse their mother-in-law is no longer their mother-in-law. I know of no way to un-mother-in-law a woman once she has been mother-in-lawed in. If you have had eight spouses and divorced every one of them then you have eight mothers-in-law.